Every font lover prides themselves in owning a library of top-quality fonts. As designers, great fonts are a life-line whenever we’re starting a new project. This bundle includes much requested sans-serif, serif, slab, display, gothic, scripted, and hand-brushed fonts. 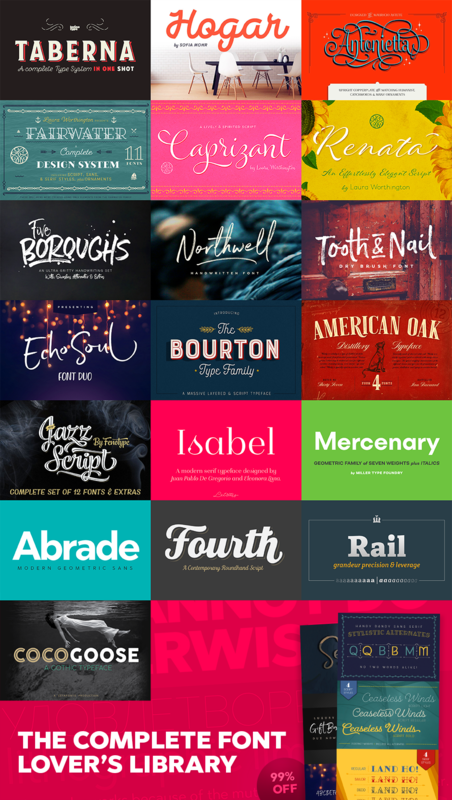 Every style font you could possibly need is covered in this comprehensive collection. This is a library that will pay for itself many times over, for years to come. This new collection is all quality, with no filler whatsoever. 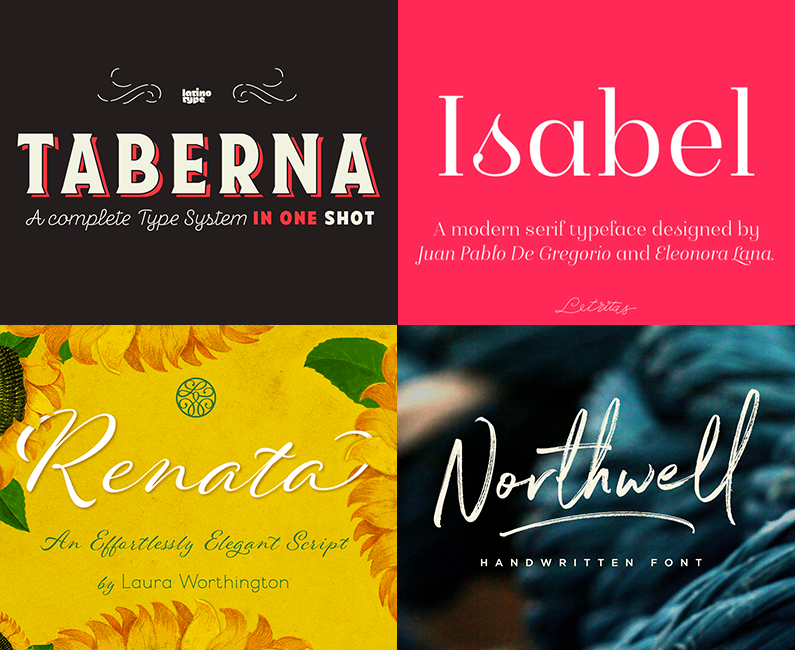 These fonts have topped every best-sellers list in the design world. Discover the most popular fonts from top foundries such as Latinotype, Set Sail Studios, Laura Worthington, Kimmy Design and more! From the hugely popular Northwell Brush Script, to Bourton (a world best-seller in the past year! ), this is the first time these fonts have been available at anywhere close to this kind of discount. Virtually every font in this bundle would cost more than the cost of the entire bundle at regular price. This is your opportunity to expand your font library with superb quality fonts that you’ll use for years to come. Whether you’re looking for an elegant scripted font, or a bold display font, this collection includes every style you could ever need. Not only that, but we’ve selected fonts that compliment each other beautifully. No more headaches trying to find the right font pairings, every combination you need is ready to use, right inside this bundle. This means that you can even use your fonts in commercial work available for sale! Check out the full license details here. Taberna is a type system that provides a wide range of choices for any design project. The typeface comes in Sans and Serif layered versions plus a monolinear Script font. Taberna is the result of having explored design trends in bar signage, liquor packaging and street wear. Taberna is a funny display font with a Sans version—that provides a more clean and simple design—and a Serif one, which gives text a more distinctive and sombre personality. The Script version matches perfectly with the heavy Caps of the typeface. Taberna is a very versatile font well-suited for headlines, posters, logotypes, etc. This font is the result of merging my architectural background and my love for typography, which inspired me to create a system of fonts based on interior architecture design, furniture design and, especially, the love I feel for my home. The system comes with a mono-linear style in sans and script versions, each including 5 weights, that share similar proportions, weight interpolation and details. 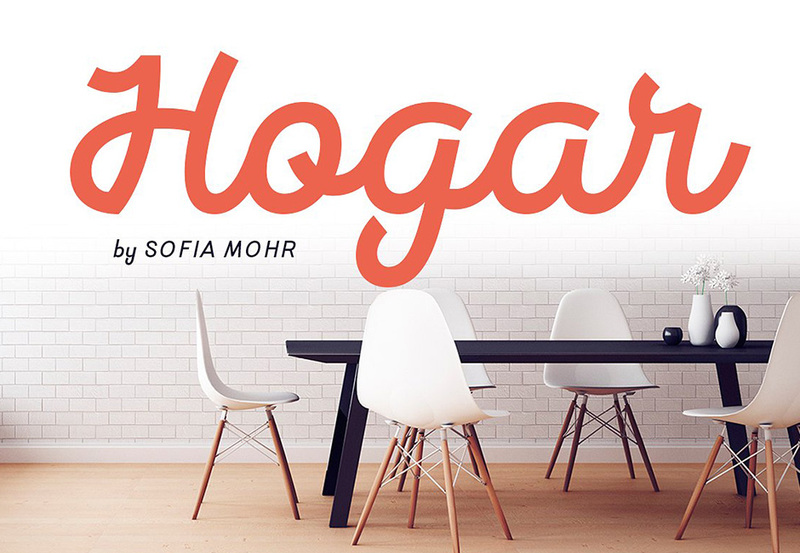 Hogar is basically a sans with script gestures and a script with sans shapes. In order to make the system more complete, I included an italic version, also in 5 weights, which represents a transition between both main styles. Additionally, I developed a set of monolinear dingbats including some furniture designs by well-known architects. The family supports more than 200 Latin derived languages. Antonietta is Mauricio Astete Brito’s first typeface, which is inspired by the eccentricity of the rococo style and Queen Marie Antoinette’s wild personality. This project, supervised by the Latinotype Team, was born from the idea of turning lettering into a digital typeface. Antonietta is based on the Copperplate style and inspired by the works of, among others, Hermann Zapf, Ricardo Rousselot and Herb Lubalin. The font comes in the following variants: Antonietta Script, Antonietta Caps, Antonietta Caps Illuminated, Antonietta Caps Shadow, Antonietta Caps Inline and Antonietta Ornaments. Antonietta Script is characterised by a big x-height, condensed proportions, and short ascenders and descenders, which can be modified by using the contextual alternates included in the set. Antonietta Caps, a companion font to the Script, is an all-caps typeface with rational structure and high contrast between thin and thick strokes. Antonietta is a 7-weight typeface well-suited for logotypes, labelling, headlines and short text. The Script variant contains a set of 878 characters that provide a wide range of contextual alternates to fit any project. The typeface also comes with an ‘Ornaments’ variant, which includes dingbats, borders and catchwords that complement the rest of the fonts. Fairwater’s aesthetic derives from three sources: the cursive handwriting styles popularized in the early to mid 1900s, the simplified, forgiving letterforms of tattoo lettering – and the pictorial themes that informed early-to-mid 20th-century naval tattoos. The Fairwater family includes two highly legible sans and script faces – friendly, monoline, and casual – in light, regular and bold weights. As with many of her faces, Laura can’t resist adding a plethora of swashes and alternates to the script version – 465 to be exact – for a total of 2,230 glyphs. Fairwater also includes four showier serif faces for use at display sizes, culminating in the vaguely botanical “Sailor” and elegantly striped “Deco” weights. Fairwater also includes a powerful decorative font entitled DIY Lines: 250 ornamental characters of ships, anchors, oars, knots, rope, botanicals, diamonds, arrows and more. With strokes and proportions that perfectly complement the type, DIY Lines expands the Fairwater family into a powerful design kit that evokes 20th-century craftsmanship, maritime themes, and colorful, salty personalities. A lively upright script based on letters inked with a pointed pen. In its default setting, Caprizant is understated and readable enough to use at smaller sizes — in short blocks of body copy it can easily mimic beautiful handwriting. Alternates of every letter, plus dozens of ligatures, provide convincingly human variation. Both casual and upscale, Renata features inviting, unpretentious letterforms, stroked by the hand of an experienced calligrapher with a small brush-tipped pen. Renata has a fluid, languorous look that suggests elegance, quality, and a handcrafted touch. It’s exceptionally readable thanks to its high x-height and spacious connecting strokes. It also looks exceptionally natural – every lowercase letter includes not only its normal connected form, but a beginning, ending, and an “isolated” form (useful for settings like “mar y sol”, “o sole mio”; lettered lists; and creative uses like wordmarks). Renata also includes a full complement of alternates, ligatures, and swashes. Meet Five Boroughs, a delightfully playful typeface! In honor of New York’s Five Boroughs, this font set was designed to be reminiscent of the Big Apple: gritty and smooth; rugged yet soft; rough, beautiful and versatile. You may need a Glyphs Panel to access the ligatures and end characters. Introducing: Northwell! A rustic, dapper handwritten font with a personal charm. With quick dry strokes and a signature style, Northwell is perfect for branding projects, homeware designs, product packaging – or simply as a stylish text overlay to any background image. • Northwell – A handwritten script font containing upper & lowercase characters, numerals and a large range of punctuation. • Northwell Alt – This is a second version of Northwell, with a completely new set of both lower and uppercase characters. If you wanted to avoid letters looking the same each time to recreate a custom-made style, or try a different word shape, simply switch to this font for an additional layout option. • Northwell Swash – A set of 20 hand-drawn swashes, the perfect finishing touch to underline your Northwell text. Simply install this as a separate font, select it from your font menu and type any A-U character to create a swash. • Fonts are provided in .TTF & .OTF formats. I recommend installing the .TTF files, and the .OTF only if necessary. There is no difference in function with either format. • Fonts include multilingual support. Introducing Tooth & Nail; a rustic and hearty hand-painted dry brush font, designed to work in both all-caps as well as lowercase. It also includes a bonus vector pack, featuring 24 elements designed to boost your text and reaffirm it’s hand-made style. With rough bold strokes and high quality textures throughout, Tooth & Nail is the perfect workhorse font for product packaging, promotional messages, handwritten quotes, home decor and branding projects. Tooth & Nail is reliable and familiar, like meeting someone for the first time and feeling like you’ve been reunited with an old friend. • Tooth & Nail – A handwritten brush font containing upper & lowercase characters, numerals and a large range of punctuation. • Tooth & Nail Alt – This is a second version of Tooth & Nail, with a completely new set of lowercase characters. If you wanted to avoid letters looking the same each time to recreate a custom-made style, or try a different word shape, simply switch to this font for an additional layout option. • Tooth & Nail Vector Pack – A vector file containing 24 hand-brushed elements which will perfectly compliment the font. These include swashes, arrows, key-words, paint splatters and frames. • Vector pack provided in .AI & .EPS formats. You will need a vector editing program such as Illustrator or Inkscape to access these files. Introducing Echo Soul; a free-flowing and carefree brush font duo, hand painted with love. Echo Soul speaks from the heart and doesn’t hold back. With elongated brush strokes and a natural flow, it’s the perfect choice for handwritten quotes, product packaging, and logo designs with a personal and affectionate touch. • Echo Soul – A handwritten script font containing upper & lowercase characters, numerals and a large range of punctuation. • Echo Soul Alt – This is a second version of Echo Soul, with a completely new set of lowercase characters. If you wanted to avoid letters looking the same each time to recreate a custom-made style, or try a different word shape, simply switch to this font for an additional layout option. • Echo Soul Sans – An all-caps font containing uppercase-only characters, perfect for supporting text to compliment the Echo Soul Script font. Also includes numerals and a large range of punctuation. • Special Letters are also available for several lowercase characters – these have elongated tails and look great when placed at the end of a word. These special letters are only accessible via software with OpenType capability (e.g. Adobe Photoshop/Illustrator), and can be used by turning on ‘Stylistic Alternates’ or accessing via a Glyphs panel. Kimmy Design’s Bourton Type Family was named one of the top fonts of 2016 on MyFonts.com. Bourton boasts more layering options, stylistic alternatives, graphic extras and even comes with it’s own script font! To top it off, we are providing you with a set of over 30 free bonus logo templates. These mock-ups utilize some of Bourton’s extras and contain live text. Simply change the placeholder text with your own and bam, you now have a sweet logo. Hopefully these provide some inspiration of how you can use the graphic extras, layering options and script font together to make something awesome. All font are provided in .OTF and .TTF format, as well as a webfoot kit. I’ve always been drawn to the beautiful typography of Whiskey, Gin, Rum & Bourbon bottle labels, as they enhanced the history that is behind these aged old spirits. With a combination of elegant scripts and rugged serifs, these labels give sensibility to the slow process which these spirits go through in the distilling process. This set of 4 different styles is not bound to label design, but can be used for any creation that requires the combination of masculine and feminine, to achieve a look that is rich and classy. Jazz Script is a groovy font family of two weights to the Script, a vivid set of Caps and a gorgeous set of Extras to spice up your designs, or create custom letters with extra swashes. Inspired by 50’s and 60’s American lettering but polished with sharp but smooth vector expression, Jazz Script is a powerful tool for creating iconic headlines, packages, or logos. Each Script version contains more than 750 glyphs and is equipped with several OpenType features to easy up your access for all the goodies: turn on Swash, Contextual or Titling Alternates or manually select from the Glyph Palette, for even more Alternates to compose elegant word images. Jazz Script also has plenty of Automatic Ligatures that keep the text flowing, and then there’s Proportional Oldstyle for more bouncy numerals. Jazz Script Family has four versions: #1 is regular, #2 has inline and #3 and 4 have different styles of carefully designed printed texture on them. Isabel was made out of necessity to create a new font for children and teenagers, that could be friendly and versatile enough for text in words or even easy-to- read long texts. The purpose of Isabel is to combine all the nice and friendly features of the simple letters that the teachers teach to the pupils at primary school, as they starting to learn to read, together with the normal editorial fonts we read every day. In this way, it generates a very joyful serif font, or even friendly font, with some conservative aspects. In other words, Isabel is a font that, despite being of a “classic features” typography, is proud to show its innocent and ingenuous elements, that gives this font a new point of view. The family is composed of 3 parts: the regular version, the italic version and the unicase version. Each one of them has 5 weights, 551 characters and is composed of 208 languages. Mercenary is a geometric font family made up of seven weights with italics. Great for almost any use, Mercenary is a versatile workhorse typeface. Mercenary has a neutral feel, allowing it to be used on numerous projects across different platforms. Abrade is a geometric sans serif with rational design choices for contemporary functionality. The family is designed with a medium x-height to provided great legibility in both display and text sizes. The forms are refined to work well in print and on screen. The italics maintain the rational forms, with only the essential structural changes. With 12 weights, the family is ideal for publications, digital media, corporate systems, branding, as well as your band’s gig poster. Abrade is equipped with extended language support. Features include: stylistic alternates, small caps, figure sets, and lots of OpenType features to keep designers happy. Fourth is a contemporary round hand script with a classic feel. It draws inspiration from classic Americana – baseball scripts, sign painting and branding. The family consists of seven weights with ornament extras for good variety in layout and logo development. The forms are rational and refined for consistency and legibility. Contextual alternates are included for smooth initial and ending forms. Stylistic alternates are available for the commonly substituted forms; s, r, l, f, k, and z. Fourth also features Swash capitals, swash lowercase, underlines and catchwords for custom styling. The precise construction of this slab serif signals the greater effectiveness of the letters that are coupled together in a beautiful harmony. Its construction is very legible, pleasant and familiar. The typeface’s x-height is approximately 68% of its capitals. Rail italic is constructed at 11° angle. It is developed to provide real italic construction but enhanced with mechanical appearance. This makes the whole typeface very special and recognizable. Please note that this is the basic version of Cocogoose, and only includes 7 out of 17 weights. The basic version comes with English language support only. Cocogoose Basic is a geometric sans serif typeface designed with straight, monolinear lines and circular or square shapes. It’s strong, modernist look has been softened by rounded corners and slight visual corrections that make Cocogoose Basic not only perfect for logos and headings with a vintage feel, but also very readable as a text font, thanks to its generous x-height. Cocogoose Basic is part of the Coco Gothic family, a collection of twelve typefaces each inspired by the fashion mood of every decade of the last century, named in homage to the beloved fashion icon Coco Chanel. Its strong character makes it ideal for display uses. It features a larger x-height than Coco Gothic, it has square punctuation and it comes with four weights, from regular to ultra light, as well as featuring three display variants: letterpress, inline and outlined. Please note that this is only the basic version of Cocogoose, which offers a total of 7 weights ( Cocogoose-Letterpress, Cocogoose-Light, Cocogoose-Outlined, Cocogoose-SemiLight, Cocogoose-UltraLight, Cocogoose, Cocogoose-Inline). 19 versatile, all-encompassing font families (featuring a total of 219 individual fonts), perfect for adding professional typography to your design work. Deal includes our extended license. Please see full license details here. We are now offering a ‘quick install' file, to be found as a separate download. This allows you to install all .OTF desktop fonts included in this bundle in just one step. The best font bundle I have ever seen (loooads of high quality fonts) and I can not forgive myself that I missed it. I’ve red the comments above, but I just have to ask/try – Is there any chance to buy this bundle? Thanks so much for your lovely feedback! Is there a chance to get this bundle? Or are you bringing it back soon? I’m seeing theses other comments and hoping I can get some love. Thanks! I just saw this incredible offer on Spoon Graphics blog…. but it is too late for me. Can you tell me how I can receive your deals in time? Thank you so much for your comment and I am so sorry that you missed out on this one! As we now have our marketplace, we will no longer be featuring our older bundles as re-runs in conjunction with our new bundles. I’m so sorry to disappoint you! Hello, amazing deal…Is there any chance I still can get this? Thank you for your comment, I’m really sorry but I’m afraid that this bundle is now completely expired. I’m sorry for any inconvenience caused but rest assured, I’m here to help 🙂 I’ve sent you an email to help you pick up a couple of these items. Hi, I have tried to install Kimmy Design´s Bourton Family and it produces warnings that there are problems with the validation. So I stopped. It is the only font I have had a problem with from the bundle. Can this be fixed and updated? I could really use this font now. Thanks for all the awsome curating, I love your products. I’ve sent you an email to assist you further with this. I hope it helps, and please don’t hesitate to let me know if you have any other questions. I’m always happy to lend a hand! =) this looks like it was an amazing deal! Please put me on the list of those hoping to see it return. I was pretty much decided that I was going to get it then I was called away and didn’t get back in time. Thank you so much for your comment! I’m really sorry to hear you missed out on this bundle! Rest assured, I’m on the case to assist you with this 🙂 I’ve sent you a quick email that should help! Hello and thank you for the fantastic bundle. I’m having some trouble with the webfont versions of JazzScript, neither the eot, ttf or woff files are working for me. All the other fonts (so far) have worked fine. Oh no! I was going to order this one but I got interrupted. Now I came back to get the deal but it has expired.. Could you please send me an e-mail too? Thanks! I missed this deal by the minute..poor me. Is there any chance a similar deal (or even the same) might come back? Was doing everything in my power to resist, then I saw the beautiful font with my wife’s name: Renata and I had to do it. So many good fonts in here. Wow. Aww, that’s lovely, it must be fait! We super appreciate your purchase so thanks for your support on this one and we really hope that you’ll love working with all your new fonts! Awesome bundle! 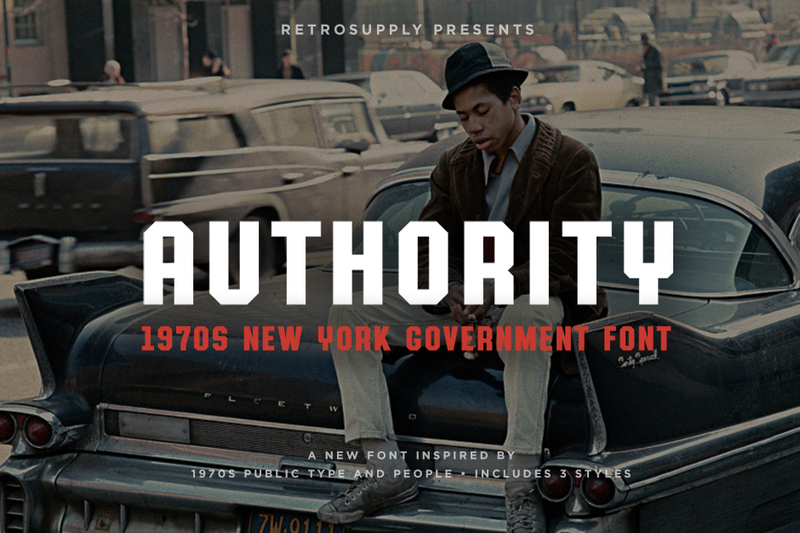 I took a good look at it and it’s really a great collection of highly useful typefaces. Keep the good stuff coming! Cheers from Brazil! Thank you so much for your wonderful feedback! Please explain how to install. I am using Windows 7 & tried to drag into Fonts folder but doesn’t seem to work. Thanks. I hope this helps, Rhonda, and please don’t hesitate to contact me should you have any other questions. I’m always happy to help! Always pick up your font bundles whether i need them or not. Can you start providing TTF and OTF in separate downloads? I always have to trim those out of the files so i don’t end up with duplicates in my library. Thank you so much for your comment! The great news is that we do separate all of the .otf font files in our Quick Install link which will allow you to download all of the fonts in this pack and install them in one go 🙂 We hope this helps you get up and running with your new fonts even quicker and avoid any duplications in your font library! Thanks again for your comment, Chris, and please don’t hesitate to contact me should you have any other questions. I’m here to help! I use Suitcase Fusion though – and dont necessarily want them installed in my system fonts folder. So i don’t think that helps me in that case. Thanks so much for coming back to Ben! You had me at “Laura Worthington”. You could have a different price for the bundle, and a better price for those who subscribe (say $29 for non-subscribers and a yearly/6 month subscription cost whereby each bundle will cost your guaranteed purchasers, like $25). Oh, I would LOVE A TO SEE a function of this website that tells me if I’ve already purchased something. Was looking through my downloads and realized I bought one of Lisa’s graphic packages TWICE! Stupid me. More profit for you, but since we tend to have so many DC graphics it’s easy to lose track, it would be very helpful (like on Creative Market) to see that if you’ve purchased an item already, it takes you to it’s download page. Help! I’m so sorry to hear that you have a duplicate item in your account! Rest assured, I am on the case to rectify this for you 🙂 We always included whether or not an item has featured in a previous deal on each item’s product page but rest assured, an automated system is certainly on our radar for a future update to our marketplace! Thanks again for your comment Stacy! I’m just emailing you now about this duplicate item but if there is ever anything else I can assist you with please do let me know. I’m always happy to help! I tried SO hard to resist… to no avail. Thanks for this awesome font bundle guys. So good! What a collection man!! Crazy price! Thank you. Love these! Thank you so much for such a great resource and thank you especially for the Quick Install pack! It’s SO nice to be able to just drag and drop all 219 fonts at once! You guys are a fantastic resource and I am VERY grateful for all you do! Have you considered doing something similar with any of the extra illustrations that sometimes come in your packs? Packaging them separately as well? I know it adds some extra bulk to the download, but the font ones are relatively small downloads (in comparison to your vector packs, for example) and it wouldn’t be too much more and would be nice to have those already separated out, too. Just a thought! Thank you so much for your incredibly kind words! It’s great to hear you are loving the quick install download link featured with bundle 🙂 we hope it means you’re able to get up and running with your new fonts even quicker! Thanks again for your lovely comment, Kat! We hope you are enjoying your new fonts but if you do have any queries, please do let me know! I’m here to help! For some reason I thought the new bundle will pop up next week… My bad. Well, here I am at the bottom of the comment pile this time 😀 . I’m too weak to resist font bundles from DC. It’s like I’ve been hypnotized whenever I see any bundle title with the word FONT in it. Auto scroll will follow, then comment. Then 5-star rating. Then hitting BDN button. It’s like an automatic chained reaction. Now.. who is the grand wizard in DC that did that? LOL I’m just kidding of course.. (even if there IS a Wizard of DC) haha. But one thing for sure after I own a bundle like that.. the Font Dance… yeah like.. GO DC GO DC GO DC . Thanks so much for yet another amazing bundle. I’m not expecting anything less from DC ;-). Keep it coming and say hi to the DC gang for me. Thank you so much for the awesome comment and purchase as always, we cannot tell you how much your automatic support means to us all. I totally agree with you on this one, I think the product team definitely have some wizardry going on when putting these bundles together and we are so glad that you like the look of this one! I wanted to purchase this bundle, just had a question. I’m currently shopping for a new computer but I’m not sure if I will find it before this deal runs out. If I purchase it on my current computer will it be possible to transfer the bundle to my new computer once I find it? Thanks for the comment and I can definitely help with your query! That is great to hear that our latest bundle has caught your eye and also how exciting that you are shopping for a new computer! Just when you thought it was safe to click on a DC email. . . . you got me again! top drawer as usual. Thanks so much for the awesome comment and for your purchase! Your support means a great deal to us all! Ahh I’m with Amy.^ I’m so good about saving money until your new bundles come around. I already have so many fonts, but somehow you convince me I need these ones too!! Thank you so much for your lovely comment! Haha it’s great to hear that you and Amy are on the same page with this bundle 🙂 we hope these fonts make an awesome addition to your growing font collection! Thanks again, Jasmin, and please do let me know if you have any questions I can help you with. I’m always happy to lend a hand! This is EXACTLY what went through my mind lol. Thanks for your comment, it looks like great minds think alike! 🙂 We hope you both love working with your new fonts! We hope you love working with your new fonts and you get loads of usage out of them 🙂 If you ever have any queries, please do let me know. I’m here to help! 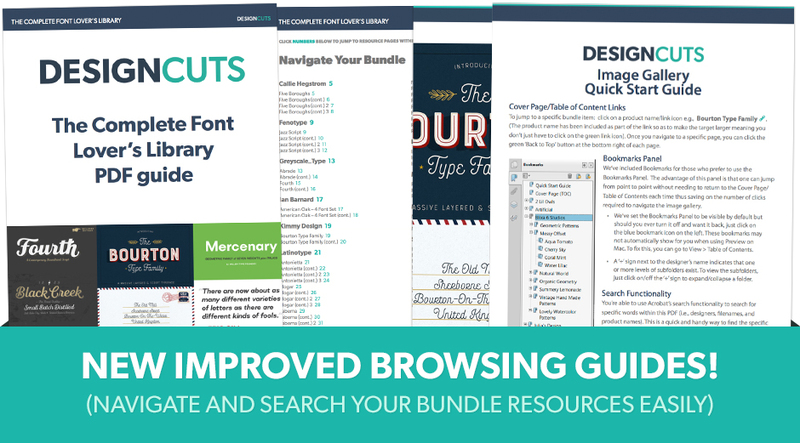 I’ve got so many design resources from DesignCuts over the years, but I can never resist a font bundle! The beautiful serifs of Isabel and Rail are great additions! Thanks DC for always doing an amazing job curating the collections. Thank you so much for your kind words! It’s fantastic to hear that you have been enjoying your purchased resources from us 🙂 We hope this fonts also make a great addition to your growing collection! Thanks again, Jennifer, and if there is ever anything I could assist you with please do get in touch. I’m always happy to help! Fantastic fonts. Can these be installed on WordPress sites? Thank you so much for your incredibly kind words 🙂 you can certainly use these within your WordPress designs but I would definitely recommend checking out our full extended licence terms here: http://bit.ly/1PVBzLH to make you sure are 100% covered 🙂 I’ve also sent you an email with more information on this. I hope this helps, Den, and please don’t hesitate to contact me should you have any other questions. I’m here to help! Thank you for the fonts. I hope I get to use all of them. I subscribed a bit less than a year ago and the emails were not anything like spam. I think I found what I need for school projects. I should of done it a long time ago but thanks again. It’s fantastic to hear that these fonts will be a huge help in your school projects 🙂 We wish you all the best in your studies and if there is ever anything I could assist you with please do get in touch. I’m always happy to help! Just made the purchase of this GREAT deal, once again I am impressed. Keep up the great job! If you have any questions when working with them or if there is ever anything I could assist you with please do get in touch. I’m always happy to help! I love fonts! I can’t believe I didn’t have 99% of these already! 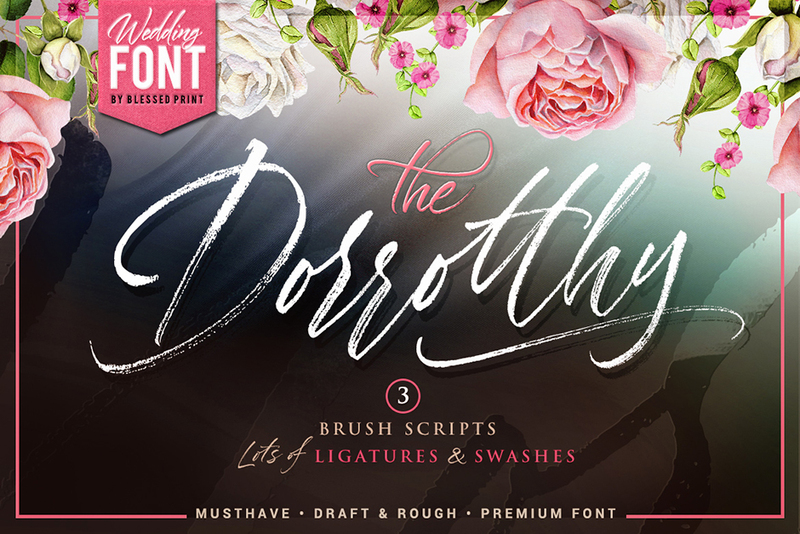 Love love love these font bundles! I always share them for my designer friends. Another great bundle! Two of them, Rail and Antonietta, were already on my bookmarked list, so was exceptionally glad to see them included in this bundle. Great work, guys and gals, picking the fonts in this collection! Thank you so much for your lovely comment 🙂 It’s great to hear that this bundle was able to tick Rail and Antonietta off of your wishlist 🙂 We hope they make a fantastic addition to your creative toolkit. Thanks again, Michael. If there is ever anything I could assist you with please do get in touch. I’m always happy to help! Display fonts for the win! Thank you so much for your incredibly kind words! It’s fantastic to hear that you are loving the layered fonts featured in this bundle 🙂 We hope you absolutely love working with them! Thanks again, Xander, and if you have any questions or queries when working with these resources, please do let me know. I’m here to help! I thought the exact same thing! I really appreciate the quality of the fonts and that they’re not entirely handwritten script fonts like all the other websites! We hope you love working with your new fonts but if you ever have any questions or queries when working with them, please do let me know and I will happily lend a hand! Just wanna ask, do these fonts include polish marks? Thank you so much for your comment, I can certainly assist you with your query 🙂 I’m really pleased to report that some of these fonts do feature Polish language support. I hope this helps, Mikolaj, and please don’t hesitate to contact me should you have any other questions. I’m here to help! Jimmy Knuckles here with another Dr. Observo moment: In the bundle description near the bottom of this page, it mentions 19 Font Families with a total of 222 Fonts in Total. I checked through the folders and I believe that this is a simple typo. If you look in the Quick Install Folder, it shows 222 “Items”, but 219 FONTS. The other 3 files are Laura Worthington PDF typeface manuals – therefore making the 222 files, but only 219 Fonts. If you can please confirm, I don’t believe ANY fonts are missing, but just in case others start to wonder???? BTW – It’s official now: I had to start un-installing some fonts (mostly downloaded freebies) so as to make way for the constant barrage of DC FONT GOODNESS! Thanx guys ‘n’ gals. Thanks so much for the spot on this and you are completely correct in your observations! We had accidentally counted the PDF’s as fonts as well so there are 219 fonts in this one and we have updated the text to confirm this as well. Good spot on this one and we really appreciate you letting us know! Hopefully you are enjoying your new fonts and as always Dr Observo, please do feel free to share anything you create :). Thank you Captain Observo! Excellent insight that I have been putting off! DC is seriously messing with my font management software and it’s time for a clean-out. Just cannot say no to Laura Worthington, and you guy are total enablers. I already have Renata but *can’t resist* anyway, especially with Hogar and Rail. Happy first day of Feb and thanks for the awesome comment :). We are super pleased with this being the first font bundle in 2017 so fingers crossed you love it and get tonnes of use out of it Liv :). Another Insta-Buy! I live in fear that I will one day overwhelm my poor CPU with gorgeous fonts, but who can blame me? I already had a copy of Laura Worthington’s Caprizant, but have been eyeing Fairwater so there was no question I’d be buying this bundle no matter what else it included; I’m glad to pick up gorgeous script Renata, too! Fenotype is another of my favorite and this font, with its counter-intuitive direction on many of its loops (perhaps it’s intuitive for left handed folk?) sets this script apart from (most? all?) script fonts living on my CPU. I like that this deal has a little bit of everything: sans serif in multiple weights, a slab, and a swirly script font. I LOVE that this collection has three of my “lots of fun for the buck” fonts: layered fonts, modern handwriting fonts, and fonts families with fonts that effortlessly coordinate. Thank you to the artists who create the lovely fonts and to the Design Cuts personnel who negotiate and assemble the bundles for us! Thanks again, Mish! We really appreciate your support and we hope you love working with all of your new fonts 🙂 If there is ever anything I can help you with please do get in touch. I’m always happy to help! FONT BUNDLE!!! Shut up and just take my money already! This comment has us all laughing over here lol- we are delighted that you are loving the font bundle and hopefully you will get tonnes of use out of it :). By the way… 5 stars as usual! You guys make the best help files, I’m always referring back to them! Thanks for the awesome review on this bundle- we are so pleased that you like this one and thanks for your support! I’m a fontaholic myself so I know these ones can be hard to resist- however now you have some lovely fonts to play with alongside your vectors from our last deal…. :). Thank you so much for your incredibly kind words! It’s fantastic to hear that you are loving our font bundles and that Rail and American Oak will be great additions to your current project! Thanks again, Kristianus, and if there is ever anything I could assist you with please do let me know. I’m always happy to help! You’ve got my money again. Happy now? Some of the nicest script fonts yet. And stellar presentation, especially for Renata and Five Boroughs. Thank you so much for your purchase! It’s great to hear you are loving the script fonts in this bundle 🙂 We hope they make an awesome addition to your creative toolkit along with all these other fonts! Thanks again, Tibor. Happy Designing! PS. Ian Barnard’s fonts are the best! This is awesome, thanks so much for the incredibly kind words! We love Ian’s fonts too and are so pleased to hear that they are some of your favourites. A subscription service would be awesome!! You could offer a smaller bundle for a monthly fee. GUYS. STOP. I’M TRYING TO PAY RENT & GROCERIES. LOL. JK. NEVER STOP. Love you forever, this is a gorgeous collection. THE SERIF’S!!!!!!! You listen to us and that means so much. Have a great day basking in the affection from the DC community. You deserve it! PS. Who needs groceries when you have a ballin’ font collection? AM I RIGHT?! There is a Russian proverb: A spoon of tar in a barrel of honey. In our case this spoon of tar is Cocogoose. Your guys request sometimes in comments to send you info about fonts with Cyrillic support. Ok, I can name one just now – it’s Cocogoose. This font has Cyrillic support, but… it hasn’t! What’s the point to deploy font demo-versions in your deals and make these deals not so good that it would be? DC deals is absolutely the best all over the internet, sо I hope it will still remain the best. I see only one option to be the best deal supplier – to include the best and complete fonts with reasonable license. P.S. In general, it’s an awesome deal, although as a Cyrillic user I’m a bit frustrated. Thank you and thanks to Jason Vandenberg for Abrade (with Cyrillic) and all other providers. Thank you so much for your feedback. I’m really sorry for any disappointment caused with Cocogoose Basic font family in this bundle. Unfortunately we were not able to feature the entire font family but it’s such an awesome font, we wanted to include it as well so that our community members could work with it! The basic font family, as you have seen, does not feature Cyrillic language support. This is always something that we do our very best to feature with our fonts and I’m really sorry to say that in this case, we were unable to feature the full version of Cocogoose. We have also updated the description of the font to ensure that their is no confusion for anyone about the language compatibility. I apologise again for any disappointment caused with this one, Evgeny. We will certainly take this on board for future font bundles and we will continue to keep an eye out for some more awesome fonts with Cyrillic language support for you. Thanks again for your feedback and if there is ever anything I could assist you with please do get in touch. I’m always happy to help! Sometimes you guys just make it impossible not to buy. Every font bundle is gold. Thank you! We hope you enjoy working with your new fonts and if there is ever anything I can help you with please do let me know. I’m always happy to help! This is one freakin’ amazing bundle. I was sold once I reached ‘Laura Worthington’ because I love her stuff.. but then it just got better and better! Thank you so much for your amazing feedback! This is the first time I have left a comment, but I just have to: FIVE fonts from my running Wish List! Three of them were in the top five! That is pretty awesome. Thanks!!! Thank you so much for your very first comment on our deal page! And what a lovely comment it is 🙂 thank you for your kind words! Thanks again for your comment, Lois! If there is ever anything I could assist you with please do get in touch. I’m always happy to help! Thank you so much for your incredibly kind words and for your purchase! We really appreciate your support and we hope these fonts make a really useful addition to your creative toolkit. I hope this helps, Graham, and thanks again for picking up this font bundle! Please don’t hesitate to contact me should you have any other questions. I’m always happy to help! I hope this helps, Lamia, and please don’t hesitate to contact me should you have any other questions. I’m always here to help! Is the sale still going? If I press on the buy button it still says it’s $29. Too scared that my card will have a huge bill. I Originally saw it last night at -7 min but wasn’t going to risk a $2420 bill. thanks for the comment and don’t worry, the font bundle is still available and will be for the next few hours! It will expire around 3pm, our time in London. Rest assured we wouldn’t charge you the RRP on this one- when the bundle expires, it means that the fonts are no longer available from us at that price but it doesnt revert to the RRP on you :). Thank you so much for getting back to Carol! I’m really sorry but I’m afraid this bundle is now expired but not to worry, I’m sending you an email to help get you up and running again 🙂 I hope it helps! YES! Please. Just give me a subscription. I can’t say no most of the time, anyway. Take my money … I feel this way every time you all come out with a new package! I hope this helps, and thank you again for your kind words! We hope you are enjoying your new resources and if there is ever anything I could assist you with please do get in touch. I’m always happy to help!